318ti.org forum > Garage > I'm thinking about buying a ti. About to buy a 318ti & would love advice! I'm thinking about buying a ti. Ask all your questions about the possible purchase of a ti. Keep in mind, we are biased. Hello. I've been running waste vegetable oil in old 1980's Mercedes for 5 years now, and can't keep up with all the little stuff that keeps breaking on them. I can't wait to get a 318ti. From everything I've read on here, they are very reliable with regular maintenance. Ideal I want one with under 100,000 miles, but have found one that appears to have been well maintained with 147,000 I'm going to go look at for $5k. I live in San Francisco, should I hold out for a lower miles car? Any advice would be appreciated! This is what I know has been done to the car recently, and the guy says he has all the recored back to the dealer purchase. I think CA cars generally fetch more money than the rest of the country. Two issues off the top of my head are going to be window regulators and headliner. I am going to sell my car in the next few weeks. 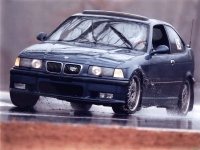 1998 BMW 318ti. 120k miles, auto, all leather interior, maintenance records back to dealership purchase. Recent things done: Rebuild cooling system [except water pump and radiator, but will give you the water pump I have for it], brand new brakes/pads/sensors all around [Balo rotors, Mintex pads], cooling system flush, brake fluid flush, control arm bushings replaced, subframe mounts/bushings replaced. Windows re-greased with Teflon. Clean bill of health from Helmut & Vito's [independent BMW shop here in Downers Grove, IL]. Asking $4900 obo. Quite frankly, car had Inspection II at 101k...and it is due for Inspection I at about 150k. I have done the necessary work to the car that all you will need to do is just check the belts and change the filters and spark plugs. So, you have 30k miles until that date. Last edited by eraser1320; 05-07-2010 at 11:30 PM. Hi, I just bought mine a few weeks ago. 100k miles 99' Did the basic checks, VIN check, my own inspection, my mechanics inspection. I made a Big compromise by buying an automatic because of the condition of the car... near mint body, and for Canada this is rare. Car was sitting in a garage for the winters, so the front suspension is to change, I'm not a mechanic but I think thats what causes the shocks to go (and age). I knew when buying it. First thing I did was change oil and the sparkplugs were the wrong type, since then idle is perfect. The ABS and traction control come on and off, cannot find a pattern for what causes it but from what I read this is classic for those cars. Will have to check the sensors. No recalls for those cars from what I find. So a little maintenance on a 'paid' car of this quality for me is a lot better than a warranty on a 15k $ new car. Even if it's automatic - + I can play around with it and my last trip was for close to 400 miles and I did 29 MPG.. even if I pushed it a few times over 100 MPH. Since they stopped importing Ti's to the states in '99, the newest one you can get here would be 11 years old. Looking for one with under 100k would be like searching for a needle in a hay stack. If you do find one for sale, expect to pay top dollar for it because that owner drove it less than 10k miles a year and it probably holds a special value to him/her. I'd look at the car, drive it and see how it feels. I found one from San Jose, 83K miles, lots of extras, beautiful condition. So I know they are out there. If you like the one you are looking at then decide. Good luck and enjoy the hunt.